Job interviews are all about making a positive impression—and that’s something you can do even once the interview itself is technically over. 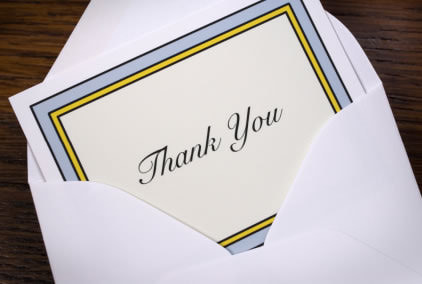 Within a day or two of your job interview, send a thank you note to the person you interviewed with. It doesn’t matter whether the interview was a triumph or a total disaster; it doesn’t even matter whether you still want the job or not. You never know when you might encounter someone from that organization again, and it’s simply wise to make sure you leave that strong impression. Even before you exit from the interview, one thing you can do is ask everyone you’re interviewing with for a business card. That way, when you send thank you notes, you don’t leave anyone out—and you don’t get anyone’s name wrong! At the very least, take an extra minute to confirm that you have all the names right before you leave the office. As for actually composing your thank you note, here are some tips to keep you on the straight and narrow. Send an individual thank you note for everyone you interview with—not just one blanket thank you for the group. That personal touch goes a long way! If at all possible, send your thank you note within 24 hours of the interview—48 at the very most. Highlight a particular skill or achievement from your own resume that you think will align with the position in question. Affirm once more why you feel as though you’re a good fit for the position. Make sure each thank you note is unique! Remember that the people who receive them may compare them, so you don’t want each thank you note you send to be a generic form letter. Keep the letter fairly brief and straight to the point; you want to reaffirm your thankfulness for the interview and your interest in the position, but you don’t need to belabor things. A good thank you note is usually a paragraph or two. Again, it’s always good to send a thank you note—even if you don’t really want the position. Keep those impressions positive—and your bridges from burning. By the way: Sending your thank you note via email is almost always acceptable, unless you know the company to be especially formal or old-fashioned—like a law firm, perhaps. And if you need help composing a robust, effective thank you note, we encourage you to use our team. Grammar Chic, Inc. can help you craft the perfect resume, cover letter, and yes, even the perfect thank you note. Reach out to us today to learn more: 803-831-7444, or www.grammarchic.net. As a kid, you were probably forced to spend time writing up thank you notes after you received birthday presents or graduation gifts. While the chore may have seemed unnecessary at the time, it’s a skill that you shouldn’t abandon as you get older and begin a job hunt. Though thank you notes (and snail mail in general) are on the decline, in business, thank you notes are still alive and well. It’s likely that a hiring manager is interviewing anywhere from a handful to dozens of other candidates for a job. As time passes, your own interview conversation may begin to blend in with the others, preventing you from sticking out in that individuals’ mind. However, when the interviewer receives a thank you note or thank you e-mail from you, it helps to remind them what they found impressive about you during your talk. It also further emphasizes your interest in the position, and reinforces the positive impressions that you earned during your interview. Don’t treat it as a requirement: The point of a thank you note is to show your interest in the position, while helping to reinforce the positive traits you illustrated during your interview. Writing a note that seems as if your mom is over your shoulder nagging you does neither of these things. Instead of writing a generic “thank you so much for your time” and signing off, make reference to the conversation you had. This shows that you were really paying attention and were engaged. While you technically are thanking the interviewer for their time, the purpose of the note is also to show how a business partnership between the two of you would be beneficial. If the individual informed you of something about the company that you didn’t know before, bring this up again. You can also reinforce the traits you feel you could bring to the position. Make sure to list the exact position you’re applying for too, in case the person reading needs some help jogging their memory. Don’t send gifts: Some candidates believe that a bouquet of flowers or a fruit basket will put them at the top of a hiring manager’s list. In reality, this creates an awkward situation that should be avoided. A well-written thank you note is sufficient. Do wait before sending it: If you drop the note off with the receptionist as you leave, it’s clear you just fired it off quickly before the interview because you felt it was something that had to get done. Instead, wait until after the conversation, incorporate details from the discussion, and mail it later. Do proofread carefully: Just like your resume and cover letter, your thank you note must be flawless. Even though it’s a more casual form of correspondence, if you’re blatantly mixing up your “their” with your “they’re” and “there,” it shows that you don’t take time to carefully edit your work. This can lead a hiring manager to worry that the same mistakes could happen during important proposals and presentations. Check over your thank you note carefully before you send it. You may even want to ask someone else to review it for you too. While getting snail mail is a rare occasion these days (why can’t the same be said for bills and junk mail?) taking time to write a thoughtful, carefully crafted letter can help you to stand out in the running for a competitive position.